The Dubs – the Complete Record of Dublin Football 1887-2017. By Gerry Callan. Published by Ballpoint Press. This book is a labour of love and a work of great detail by Gerry Callan. It is much more than just statistics because, in its sweep across 130 years, it gives a real sense of Dublin football as a huge element within the national movement that is the GAA. Incredibly, for such an otherwise efficient organisation, the GAA’s record-keeping of matches and scores has been patchy through much of its history and Gerry has had to mine deep to come up with the facts. He tells us that in the early years he even discovered newspapers that published different results for the same matches! This book will settle some arguments about results and scores and players, both club and county, and no doubt it will start a few more. 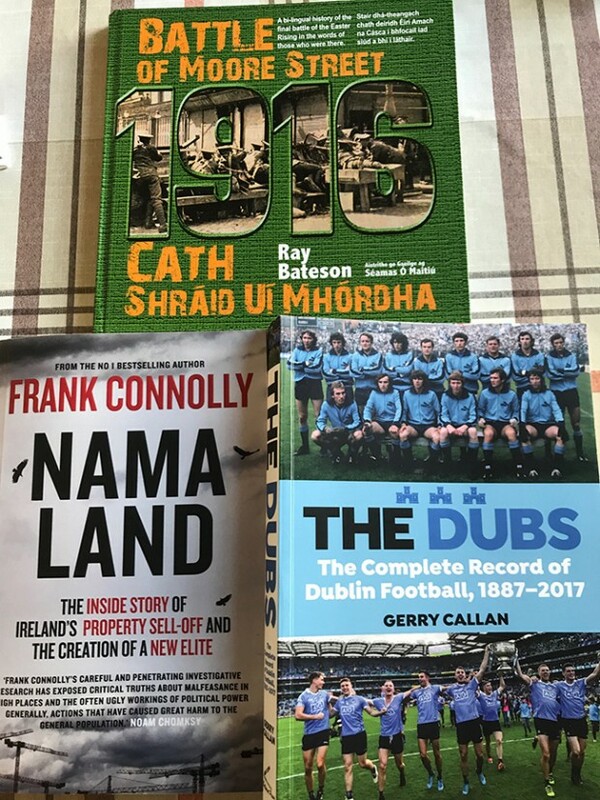 It is a pleasure to leaf through and discover, for example, if the Dubs did anything significant on the day you were born. In my own case on 8 March 1964 Dublin beat Roscommon 1-7 to 0-7 in St. Coman’s Park, Roscommon in the National League, which the Dubs went on to win that year. The book covers the full record of the senior team in the Championship and National League, managers’ records, players’ pen pics, as well as Junior and Underage teams and Club Championships. The records of individual players are fascinating. Top man for appearances for the Dubs is John O’Leary who turned out 197 times for the County, followed by Stephen Cluxton with 187, while Jimmy Keaveny (492 points) beats Bernard Brogan (451) as top scorer. I could go on, but buy the book and see for yourself. A must-have for Dubs, and a great asset for all Gaels. By Frank Connolly. Published by Gill Books. Back in 2011 when I was cathaoirleach of Dublin City Council’s Finance Committee we repeatedly requested NAMA to discuss the implications for the development of the City of the huge property portfolio they controlled. We were met with a complete refusal to meet and were told by NAMA that they did not engage with public representatives. Right from the beginning the lack of accountability, transparency and openness of NAMA was identified as a fundamental problem. In the Oireachtas, Sinn Féin and others challenged this, but it fell on deaf ears as Fianna Fáil and Fine Gael-led governments went on to create a monster. It has presided over what has been described as the greatest transfer of Irish property since the Plantations. Frank Connolly has produced a book of great detail which makes clear that the transfer of this property has not benefitted the people of Ireland but that, yet again, a wealthy elite here and abroad has reaped the benefits. 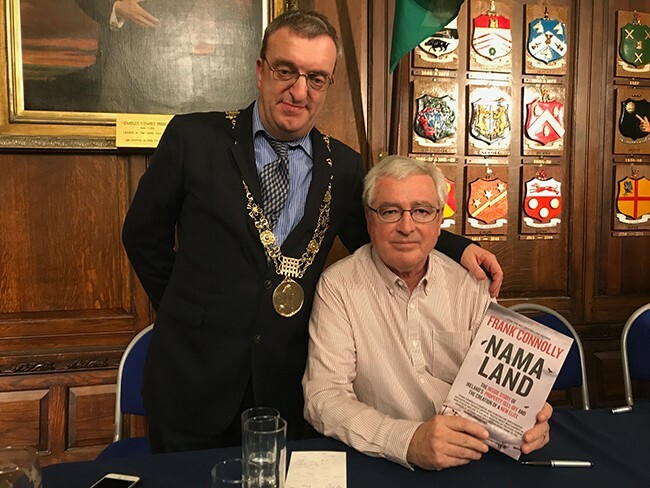 • Author Frank Connolly with Ardmhéara Mícheál Mac Donncha at the launch of Nama-Land in the Mansion House. NAMA has been a key part of the neo-liberal economic regime in Ireland that has produced deepening social division, widening economic inequality and a massive and ever-growing housing crisis. It could have played a positive role in addressing the housing crisis. It could have intervened to save the Moore Street Battlefield site when it was under its control. Instead NAMA has been driven by a purely fiscal ‘bottom line’ for Governments determined to obey the diktats of international financial capital unquestioningly, and by the profit motive for its insiders. This book should remind us that unless we have a fundamental change in property relations in this country our economic apartheid will worsen, even in the context of a United Ireland. NAMA is a prime example of how elites are able to operate in a cross-border fashion, one of the biggest NAMA scandals being the sale of the property portfolio in the Six Counties. Frank Connolly has done a superb job with this book and it is highly recommended. Battle of Moore Street – Cath Shráid Uí Mhordha. By Ray Bateson, aistrithe go Gaeilge ag Séamas Ó Maitiú. 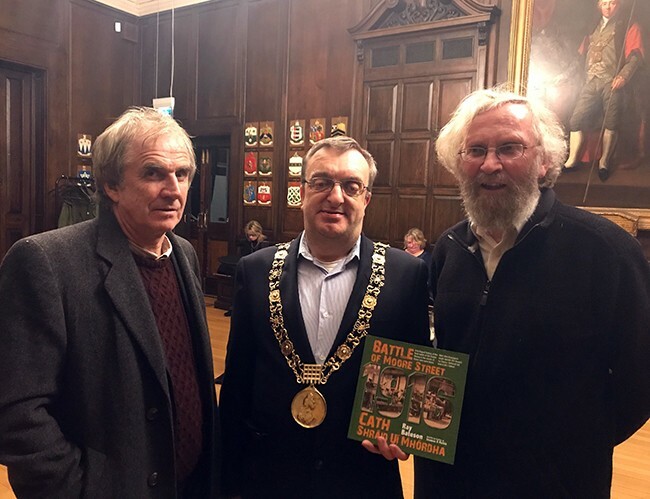 Published by Kilmainham Tales with the support of Dublin City Council. The Government’s appeal against the High Court judgement which ordered that the Moore Street Battlefield Site be saved, was concluded just before Christmas and the judgement of the Appeal Court is expected early in 2018. Dublin City Council, on my proposal at the December City Council meeting, has re-started the process to place five key buildings on the Battlefield Site on the list of protected structures. Whatever the outcome of the court case, the battle to save Moore Street is far from over. All this makes the publication of Ray Bateson’s book in an updated bilingual edition very timely. Stair dhá-theangach chath deiridh Éirí Amach na Cásca i bhfocail iad siúd a bhí i láthair atá anseo. Ar ndoigh is ann a chinn Rialtas Sealadach Phoblacht na hÉireann ar ghéilleadh d’fhonn tuilleadh básanna sibhialtach a sheachaint. Sa leabhar seo, ag úsáid focail mórán díobh a bhí ann, inste go hoilte ag Ray Bateson, tá na heachtraí corrúla a tharla sna lánaí seo na staire.